To keep your flowers fresh longer it is important to know that proper hydration as soon as you receive them is very important. The next thing you want to remember is to cut the stems at an angle, this is what allows the water to penetrate the stem and allow the head the proper amount of water it needs. After that, place the stems in a bucket with about 3-4 inches of water. You will also want to keep them cool and out of direct sunlight. The right amount of humidity is needed and the removal of foliage below the water level will keep bacteria from damaging your flowers and preserve them longer. Remember to replace your water every 2-3 days with floral food. For containers you can use glass or plastic that is properly cleaned. Do not place in metal, clay, or stone containers. If you have longer stems you may want to place them in deeper buckets to avoid having the stems bend or break. Snapdragons, spray roses, and gerberas all have a tendency to bend because of how hollow their stems are. You may choose to use floral wire to straighten by placing wire inside the stem and cover stem with floral tape to give them a natural looking appearance. If your flowers are wilted you may want to place them upside-down in cold water for 2-3 hours. Some stems tend to break a little easier than others so you may want to avoid this by tying with twine to a stick but not too tight so you can hydrate them easier. For the hollow stems you may also consider inserting pipe cleaner as well. 1. Make the right selection of colors and sizes needed to fit your theme. 2. Make the right selection of greens and fillers. You may consider fewer flowers and greens to add a bit of sophistication. 3. Make the right vase selection; especially make sure they blend well with your other decorations. Depending on the size of the table, you may choose smaller or larger vases. 1. Make right selection of flowers and fillers. 2. You may want to keep it simple by just using a single stem with exact color of theme for boutonnieres and corsages, and several stems for centerpieces. 3. Clean and prepare flowers for hydration 2-3 days prior to event and change water periodically. 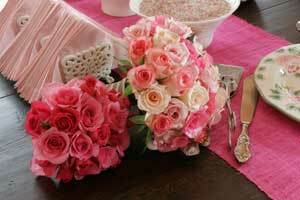 When making bouquet, make sure to wrap flowers tightly with fabric that is the same color of your wedding or event. 4. You may want to consider using the same flower on boutonniere in bouquet to give an elegant appearance.